While doctors and scientists advance in their research to understand the machinery of the human brain, artificial intelligence (AI) is already capable of hacking it. There are now AI systems to treat symptoms of depression, machine-learning software capable of recognizing brain changes caused by Alzheimer’s years before the first signs appear, and brain scans that can identify suicidal tendencies. In the case of Alzheimer’s—the main cause of dementia in the elderly—the biggest challenge is to obtain an early diagnosis and slow down its progression. Accordingly, a team led by Marianna La Rocca, physicist at the University of Bari, in Italy, has developed an automatic learning algorithm capable of discerning structural changes in the brain caused by Alzheimer’s. The algorithm was trained with 67 magnetic resonance images—38 from Alzheimer’s patients and 29 from a control group—to learn to correctly discriminate between sick and healthy brains. The researchers divided each brain image into small regions, analysed the neuronal connectivity between them and found that the software had made the most accurate classification of the disease when the brain regions compared were about 2250 to 3200 cubic millimetres, similar in size to the anatomical structures connected with Alzheimer’s, like the hippocampus. When analysing a set of 148 brain scans—52 healthy, 48 ill and 48 with mild cognitive impairment, which were known to develop the disease 2.5 to 9 years later—the system distinguished between a healthy brain and one with Alzheimer’s with an accuracy of 86%. For La Rocca, this shows that the algorithm could identify changes in the brain that lead to Alzheimer’s nearly a decade before the appearance of clinical symptoms. 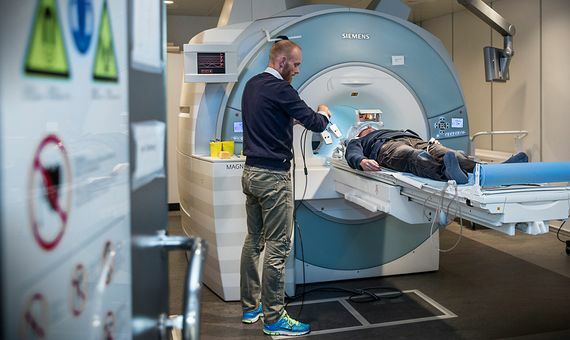 “Currently, brain scans with radioactive tracers are able to predict with relative precision who is at high risk of developing Alzheimer’s within ten years, but this is an invasive, expensive method that is only available in highly specialized centres. The new technique, however, is simpler, cheaper and non-invasive,” says the scientist, who intends to apply the method in the early diagnosis of diseases such as Parkinson’s. A group of psychologists and psychiatrists from different American universities have developed a similar algorithm to identify potential suicides. They subjected 34 young adults—divided between suicidal individuals and a control group—to functional magnetic resonance imaging (fMRI) and presented them with three lists of 10 words: one related to suicide (e.g. “death”, “fatal” or “distressed”), another with positive things (e.g. “good” or “innocence”) and another with negativity (e.g. “boredom” or “evil”). 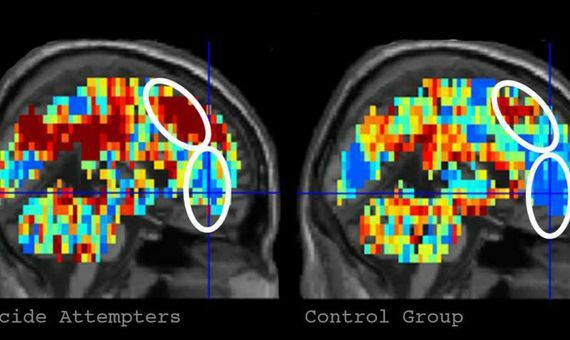 Researchers used previously mapped brain images showing emotional patterns such as shame or anger. The scientists identified five brain locations, related to six of the words, as the best markers to distinguish suicidal individuals from others. With that, they trained an automatic learning classifier that was able to correctly identify 15 of the 17 suicidal patients and 16 of the 17 control subjects. After this, they divided the suicidal patients into two groups, those who had attempted suicide (nine) and those who had not (eight), and trained a new classifier that could correctly identify 16 of the 17 patients. The results showed that healthy patients and those with suicidal thoughts had markedly different reactions to the words. When those with suicidal tendencies saw the word “death”, the shame area of ​​their brain registered a peak of activity not observed in the control group. The same thing happened in the area of ​​sadness with the word “problems.” “This gives us a window into the brain and the mind. It allows us to tell if someone is considering suicide because of the way they think about the issues related to death,” explains Marcel Just, professor of psychology at Carnegie Mellon University. In addition to helping diagnose mental illnesses and disorders, AI can also help to treat them. This is what the creators of start-ups such as Woebot believe. They have developed a chatbot that uses machine learning and natural language processing to help users control their mood and mitigate depression. With access through Facebook Messenger, the system asks users questions to assess their mood. Over time, the algorithm, trained in cognitive-behavioural therapy methods, learns the emotional profile of each user and recommends activities to maintain their balance. A clinical trial conducted in collaboration with Stanford University showed that users aged 18 to 28 years experienced significant reductions in anxiety and depression compared to the control group, which used a book on how to deal with depression. Another initiative is that of Thomas Insel, former director of the National Institute of Mental Health in the United States and co-founder of Mindstrong, which uses AI to help diagnose and treat behavioural and emotional disorders by interpreting the use of smartphones. Based on the assumption that users use their phones in different ways according to their emotional state, the algorithm uses “digital phenotyping”—a method of quantifying individual characteristics by analysing data generated by the individual use of digital devices—to suggest correlations between specific digital activities and brain activity. “Psychological and emotional disorders are a global health problem. 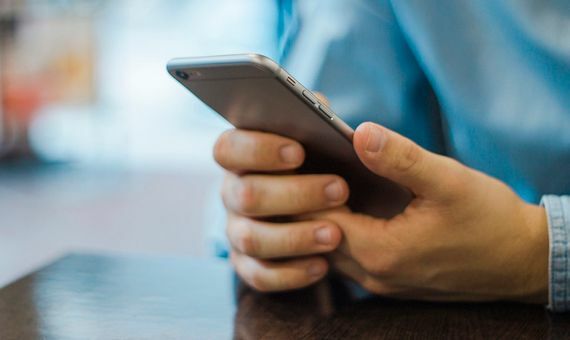 Smartphones with AI can be a global solution,” says Insel.